Congratulations to everyone who swam this weekend and thank you all for coming! What a great time we had at the OMS Association Champs. I’ve never had such a fun time at a meet as I did this past weekend. We have a wonderful group of fun, friendly, supportive, and talented people that are SOMA. I’m so proud to be a part of this newly formed team! 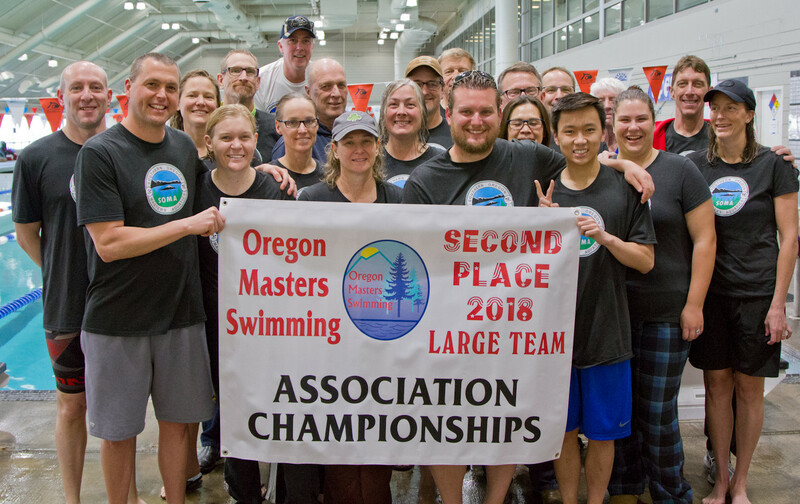 SOMA placed 2nd in the large team category behind Oregon Reign Masters who won the title….again. We’ll get them next year though! We really missed those of you who signed up but couldn’t make it and those of you for whom it didn’t work out to come this year. Please plan on attending next year as we vie for our first state championship! The meet next year will probably be in mid-April and somewhere in the Portland metro area or in Hood River. I’ll let you know as soon as I find out. I’ve attached results from the meet (with splits) and a PDF with team scores. Several people posted times that are solidly in the All-Time Oregon top 12 lists and will almost certainly hold up for national top 10 times in their age groups this year. And our 95-year-old swimmer, Willard “Wink” Lamb, bettered 5 of his national records that he set the previous weekend in Federal Way. Congrats to Willard and all of our SOMA swimmers who posted personal best times or reached goal times they had set for themselves. You all did great! For fun, if any of you are curious where your swims might stack up with all of those who have swum before you, USMS maintains a list of All-Time USMS Top Times. SOMA also had several people recognized for achievements at the OMS Awards Banquet! SOMA men owned the Most Outstanding Swimmer achievements! Just click on the “2018” link to see the booklet from this year. You can also look back at previous years if you’d like. 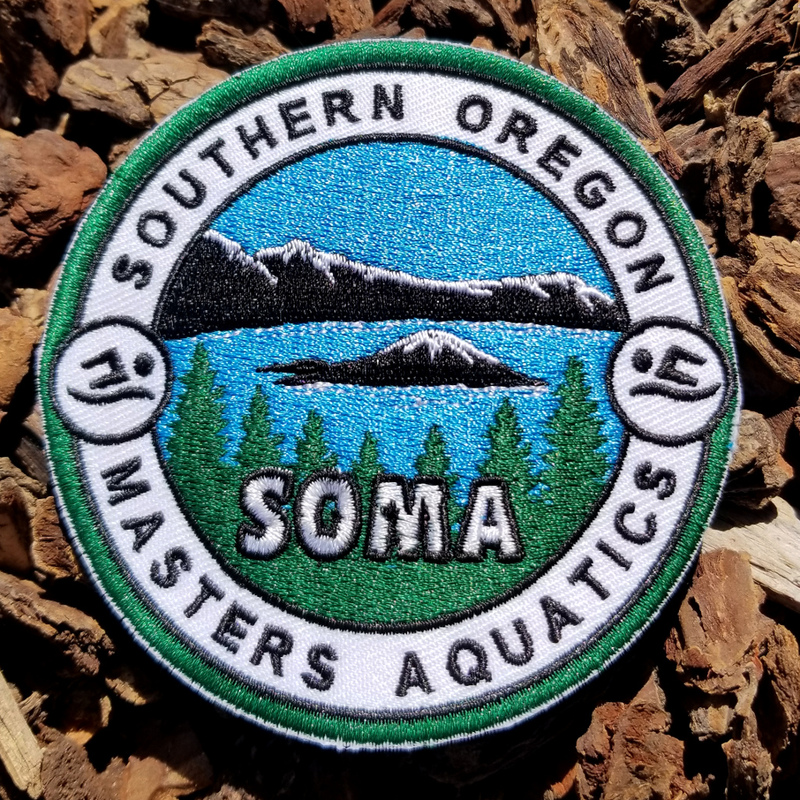 SOMA Patch for jackets, backpacks, etc. I attempted to get SOMA patches made and bring them to the meet but unfortunately, they were just a few days late in arriving and I received them today. See the attached photo. They turned out pretty nice! I would like to give a SOMA patch to anyone who wants one. Most of you I will see some time at Superior Athletic Club and I’ll have them with me in the mornings to give out. But if you live outside of the Medford area, in Coos Bay, Klamath Falls, Northern California, Vancouver, WA (our SOMA del Norte amigos! ), or elsewhere, and you would like a patch, please send me your mailing address and I’ll get one out to you. See the attached photo for what the patch looks like. They have an iron-on backing which would work fine for something like a mesh trucker hat, but they are best sewn onto backpacks, parkas, jackets, shirts, etc. They could also be ironed on in the desired place to hold them while sewing them on. This is a reminder that Yeonjoo has graciously offered to host our first SOMA team party at her house in Medford. Come celebrate with us as we reminisce about the great time we had this past weekend, have some more fun together, and plan for upcoming events. I hope most of you can make it! Location and more details are to come in a later email. 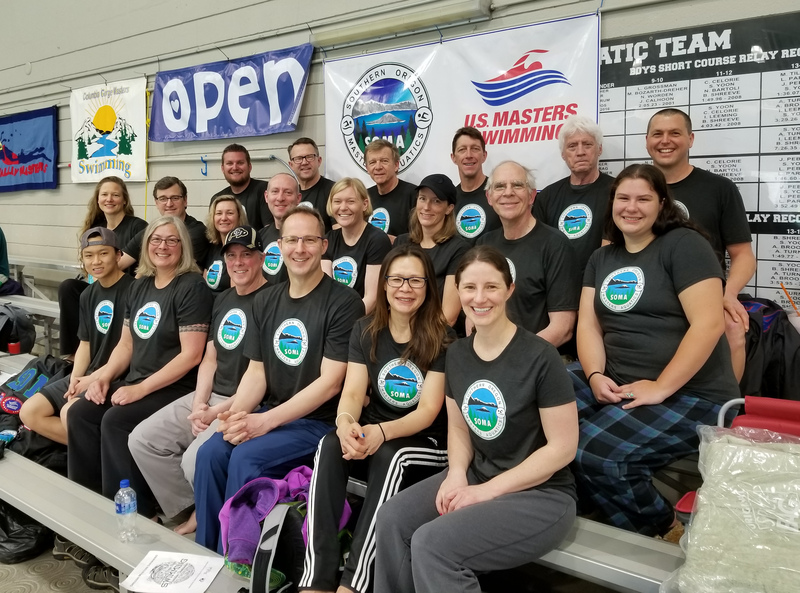 If you missed the OMS Association SCY Champs this weekend and are bummed to have missed out on the fun, don’t despair! There are other events this summer and fall that also hold the potential for some great times. Similar to the event this weekend, which is the short course champs, there is an OMS long course Champs meet every year in late August at Mt. Hood Community College in Gresham, OR. The meet is called the Gil Young Memorial Meet and will take place on August 24-26. It is an outdoor meet and the weather is usually sunny and warm. The atmosphere is more relaxed, but there still is some good team camaraderie to be had at the meet. Just like the meet this past weekend, SOMA will compete as a team against the rest of the teams in the state. There are no team size categories like there was this past weekend, so we need as many people to come as we can get in order to compete well. Put it on your calendar and plan on attending! I’ll let everyone know as soon as I do when registration opens. Lastly, in November a group of us plan on attending the PNA SCM Champs in Federal Way, Washington. A large group of us attended this meet last year and had an absolute blast. In my opinion, this is the best pool on the entire west coast and possibly the best pool I’ve ever swum in. It is an exceptionally well-run meet in an amazing facility. The meet normally takes place the weekend before Thanksgiving and I expect it will be this year as well, so go ahead and mark your calendars now and I’ll keep you updated as we near the event. I’m sorry that I didn’t get more videos than this, but between swimming my own events and doing various team-related tasks I wasn’t able to get as much video as I would have liked. In any case, below are links to videos that I was able to take. If you want the original file in high resolution, just let me know. I also apologize for the shakiness and bad filming in some of these videos!! That’s all for now! See many of you in 2 weeks at the SOMA party!